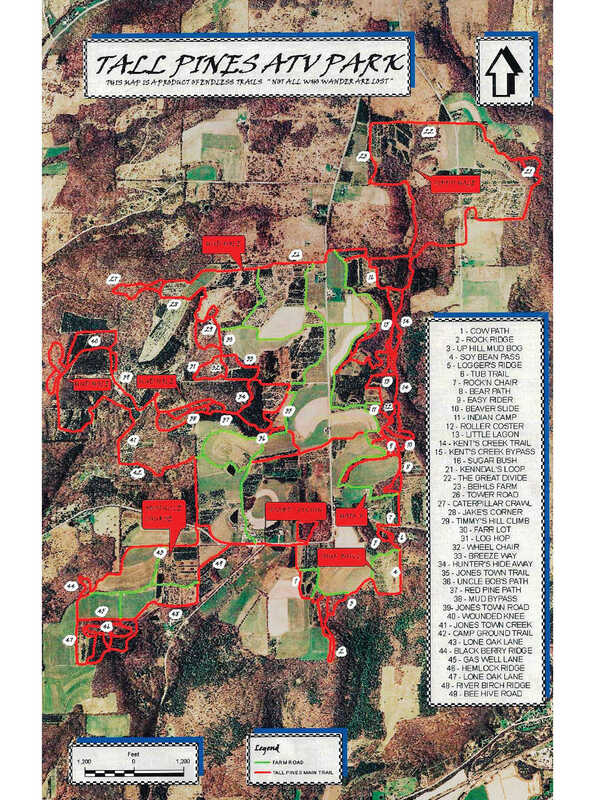 Tall Pines ATV Park near Andover, New York is the newest area for Northeastern riders looking for a family friendly trail riding adventure. It’s a little like a trip to your grandparents’ farm, a weekend camping trip, and a good ol’ mud bog and riding adventure, all in one place! Farms, fields, and forest dot the gently rolling countryside around Andover and much of the Tall Pines ride area was part of a Christmas tree farm. Today it is still a tree farm, but livestock and traditional crops, including pumpkins, are also grown on the family operation. Winding between field and forest are over 60 miles of trails for riders of all skill levels. If you just want an easy ride through the country, they have plenty of trails for you, but if you prefer something a little more adventurous and want to challenge yourself in the mud and rocks, you can do that too. Since camping and ATV riding go hand-in-hand, the family that operates Tall Pines has made camping part of the adventure, and you can bring your tent or camper and enjoy a great night around the fire. If you prefer a cabin, there are several units on site that can accommodate up to 6 people and all you’ll need to bring is your sleeping bag. The cost for a cabin is $75 per night regardless of how many people you have (up to 6); which can make it a cheap weekend adventure if all 6 throw in a couple bucks. On holiday weekends though, they prefer a two-night booking for cabin rentals. 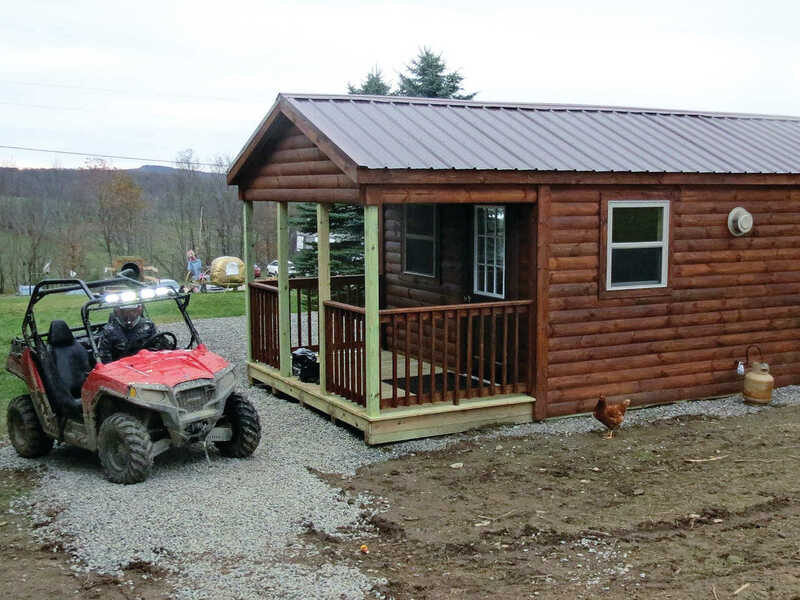 There are already several cabins on site with more on the way, but on weekends when they are hosting special events, the cabins can fill up quickly, so call ahead. For additional convenience, they have a café for a quick bite between rides and an on-site power washer to help you clean up after the ride. We recently visited Tall Pines and loved it! The trails were well maintained and we had a blast exploring the area and playing in the mud, but during our weekend, they were also holding races. That’s always great with us! Thankfully, there is plenty of room for parking and it never felt crowded in the pit area or on the trails. The staff was very friendly and there is good community support as well. Although 60 miles of trails is smaller than some other areas, because of a winding, twisty layout on many of the trails that wrap through the trees, it feels larger than it is. A well-developed trail map is a great tool for figuring out where you are and you can pick one up at the front office. Respect other riders and campers. Go no faster than 5mph through camping areas and pit areas. Riding in fields where crops are grown is prohibited. This is still a working farm and they can’t have anyone tearing out the crops. USDA approved spark arrestors are required. A spark in a pine forest can be a disaster, and this is a Christmas tree farm. Three-Wheelers are not allowed. Insurance regulations won’t cover them. There are several things we really enjoyed about the Tall Pines ATV Park. The family atmosphere is relaxed and they make you feel at home. The trails are also very scenic, and the diverse topography makes use of hills, streams, and valleys, but nothing is unpassable. It’s fun for riders of all levels, but won’t intimidate new riders. During our ride the weather was cool, but we’re betting that during summer months, you may need bug spray for the wooded sections as the mosquitos will almost certainly be glad to use you as an open buffet. When it comes time for you to grab a meal though, check out the on-site café. They serve the best cheeseburgers we’ve ever tried. The Tall Pines ATV Park is relatively new, but it’s got a lot going for it already. Trails are currently being expanded, more cabins are being built, and they’re even looking for more events to host. We enjoyed its rustic, relaxed feel and for East coast riders, it’s a great place to spend a relaxing couple days. We had a great time and we’ll gladly go back!